Wooden block printing is a technique used for printing images, texts and patterns. It is widely used throughout East Asia. It is the process of printing patterns onto textiles or paper by using carved wood blocks. 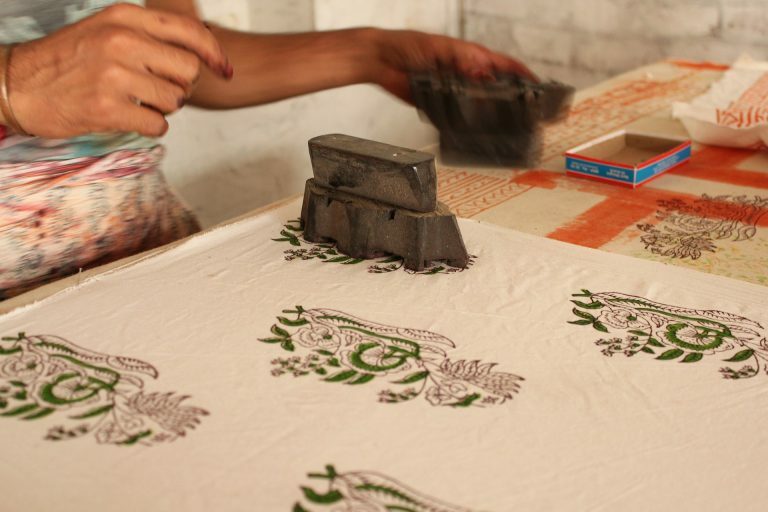 Block printing is one of the oldest, simplest and slowest forms of all textile printing methods. It is believed to date back 4,500 years in China. However, was adopted and widely used in India since the 12thCentury. It is here where wood block printing has achieved the most prominence and the most sought after patterns. They hold great expertise and secrets to natural dyeing, particularly with mordants (the metallic salts that give colour vibrancy and colourfastness). The textile communities in India are known as chhipa and khatri and can either be Hindu or Muslim. The lives of the indian textile craftspeople the khati, chippa, dhobi and rangrez are an interwoven system of functions, castes and religious communities. And they work on both block printing and dyeing. The word chhipa is thought to have come from chapana, meaning to print. Every printing and dye workshop is represented by a caste council or panchayat, which connects and units the various crafts together. Printing techniques – Resist dyeing is a broad umbrella term for all sorts of techniques.  It is where several layers of printing are used to create or define a pattern in negative space. Mud resist printing, known as Dadu, made from local black clay, wheat flour, gum and lime. By using this resit it allows sections of the pattern to be reserved from the dye. Resist printing and dyeing is sin ominous with block printing and enabling the most intricate designs. Process – from carving block to printing cloth. The prints journey begins right at the beginning with the design and the block being carved. The design is drawn onto paper and then transferred onto a very smooth flat block of wood. Time will have been spend preparing the block and making sure its perfectly flat and deadly smooth. The wood used from from a variety of different tress and what is available locally. However, many artisans favour the readily available mango wood. It must be 2-3 inches thick to avoid cracking in the carving process.The more intricate the carved design the more it demonstrates the accomplished pattern carver. Next the fabric must be prepared for the dyeing and printing. This is done by washing ( known as scouring) to remove and grease, residue or dirt acquired through fabric manufacture. Colours can be vegetable and naturally based or synthetic versions. There are an extensive variety of colours but here are a handful of the favourites. Black – This colour is made by mixing an acidic solution of iron rusted metals, (such as nails and old horse’s shoes for example) with jaggery, which is refined sugar that has been left to rot for about 2 weeks. Red – This can be made from from a material such as alizarin, alum. Pinks and reds can be achieved. Red can also be found and extracted from Madder root. Blue – An amazing colour made form the Indigo tinctoria plant found all over India and also countries of similar climate – Mexico, Africa, etc. Other natural colour sources for printing are the mango tree bark, pomegranate skins, vinegar and slaked lime. Once the fabric is ready to print it is laid out onto a long table top. The block is then dipped into the dye and pressed onto the fabric and bashed quickly and firmly to ensure even coverage. This technique is repeated over and over until the pattern has covered the length of cloth. If the design is multi-coloured then each layer of the colour must be applied and allowed to dry before the next is added. It is a slow and time consuming precision based process so that the pattern is continuous and there are no breaks in the motif. However, when this does happen it only adds to the whole nature of the technique. Giving proof it has been made by hand and not a machine or screen print. Once all the colours have dried the cloth has a final thorough was and is hung up to dry. By combining mud resist dyeing, mordants, resist stamping and natural dyeing techniques all together has allowed the Indian printers to develop the most beautifully unique intricate designs that are held in the highest respect from South East Asia to Europe. 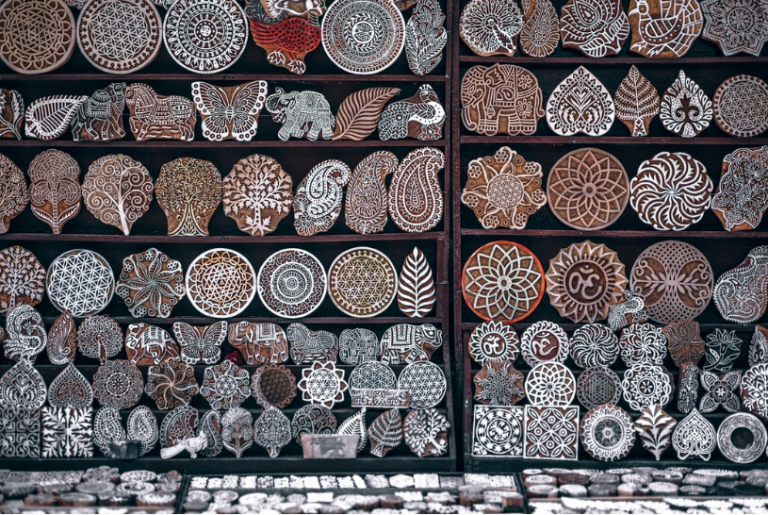 Indian printers have created one of the largest and amazing pattern libraries on earth. The consumer wanting a faster paced fashion industry and not appreciating the skill and time that goes into every stamp that makes up their pattern. Its hard to imagine back to an age when garments were made by hand and the cloth was block printed. Over time screen printing has come to replace a lot of the traditional block printing patterns due to its speed and accuracy over large areas of cloth. We are lucky that there are still some master block printing families left in India that stay true to original block printing methods and are committed to keeping this precious craft alive. Commitment to making and keeping centuries old tradition of block printing relevant and accessible.